I am loving egg flips! When 3pm rolls around and those munchkin munchies start rearing their grumpy little heads, a good old fashioned flip has been my afternoon saviour. Basically it’s a smoothie with an egg yolk cracked into it pre blend. I love them because not only are they quick and easy, but by adding an egg yolk it gives your smoothie a healthy boost by adding some important nutrients. Lutein and zeaxanthin – important for vision, and may help reduce the risk of macular degeneration and cataracts. B12 – required for DNA synthesis, red blood cell/energy production and myelin formation. 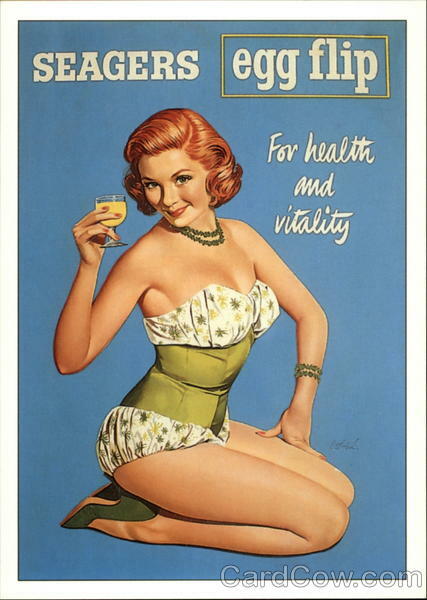 Biotin – Essential for energy production. Promotes strong hair and nails. It’s also an all natural protein shake. One serve contains approximately 19g of protein, 21g if you use two egg yolks. By comparison MUSHASHI recover whey protein powder contains 22g per serve. I don’t think that stacks up too badly, especially considering that protein powders that do not use a cold filtration process overly denatured their proteins. Denatured proteins increases nitrates, MSG, and other carcinogens (Sally Fallon). Why don’t you use the white? Apart from the egg white being the most allergenic part of the egg (not so good for little ones), raw egg whites contains avidin. Avidin is a glycoprotein which bonds with biotin rendering the nutrient unavailable to the body. By cooking your egg whites you deactivated the avidin. Although I have read that you would have to consume a fairly large amount of egg whites to get a biotin deficiency, I like to save my egg whites and make some tasty florentines with them. I kept hearing that pastured eggs are the best eggs you can buy. They supposedly have a higher nutrient value and a decreased risk of salmonella poisoning. At $12 per dozen eggs I wanted to find out whether spending that extra money is really worth it, or it’s just all marketing hype . So I put my nutritional geek hat on and did some research and this is what I found out. A non-peer reviewed report from Mother Earth News from 14 independent farms did indeed find that pastured eggs had. I also found a few good articles explaining why there may be a decrease in Salmonella in pastured eggs. Although I couldn’t find any studies that compared the prevalence of salmonella in pasture raised to other forms of farmed eggs specifically, there was definitely a correlation between increased flock size and salmonella. Hens who were housed in high density caged farms were more susceptible to salmonella. This is because of a natural increase of contaminated dust and feces for chickens living in that environment. The restricted hen movement of cage houses are also more potentially attractive for Salmonella-carrying rodents. My personal feelings are that a hen who is stressed out and covered in feces is much more likely to contract salmonella than a bird happily scratching around outdoors that may come in contact with wild birds. I do think pastured eggs, or at the very least free range eggs are worth the extra money, If not for their nutritional value then for the lack of torture that most caged hens have to endure. I love these super dooper biodynamic eggs from Mullon creek. With 150 birds per hectare apposed to 10,000, and water and feed located outside; the chooks are given an incentive to do a bit of roaming. Leading to some very happy chookies and very nutritious eggs. But.. at $11 dollars for a dozen 700g eggs, we just can’t afford to buy 2-3 dozen per week (My we are an eggy house!). I buy one pack per week and then substitute the rest with these. These are the pastured eggs I buy at Coles. At $6.30 per dozen they’re a little more within our price range. The draw back of these eggs are that the hens have less space. At 10,000 chooks per hectare it’s a lot less than the hens at Mullon creek. They do however, have a chook cam where you can go online and view the hens roaming in the pastures, which is pretty cool. So we’ve learnt a lot about eggs, now for the fun part….. RECIPES! Here are two recipes that I have been using regularly. 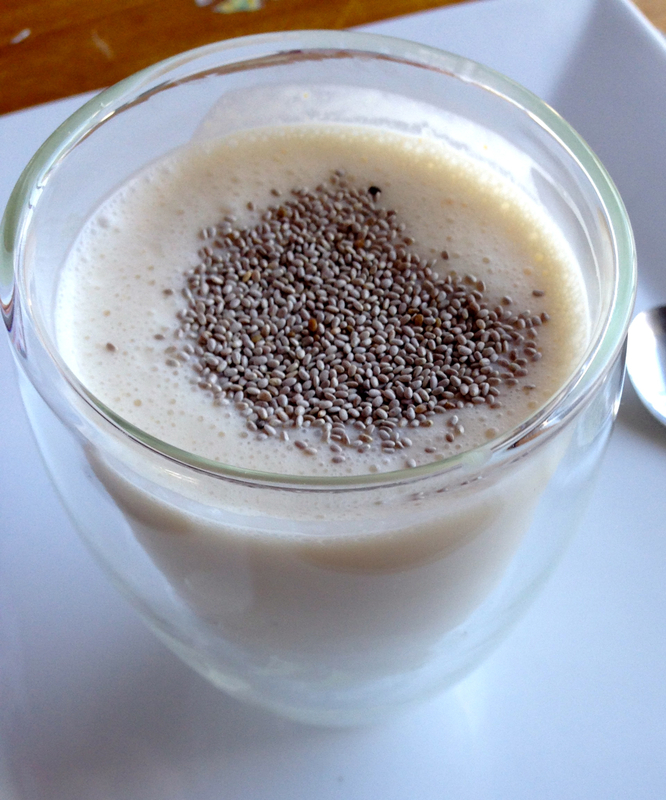 I’ve added chia seeds to my recipes for an extra boost of fibre and protein. I generally tend to sprinkle them on top and eat them with a spoon because I don’t like chewy smoothies. Feel free to mix them through if you don’t mind a few bumps. Blast away those afternoon grumps with this delightful flip. Place all ingredients into a blender except chia seed and blend until smooth. 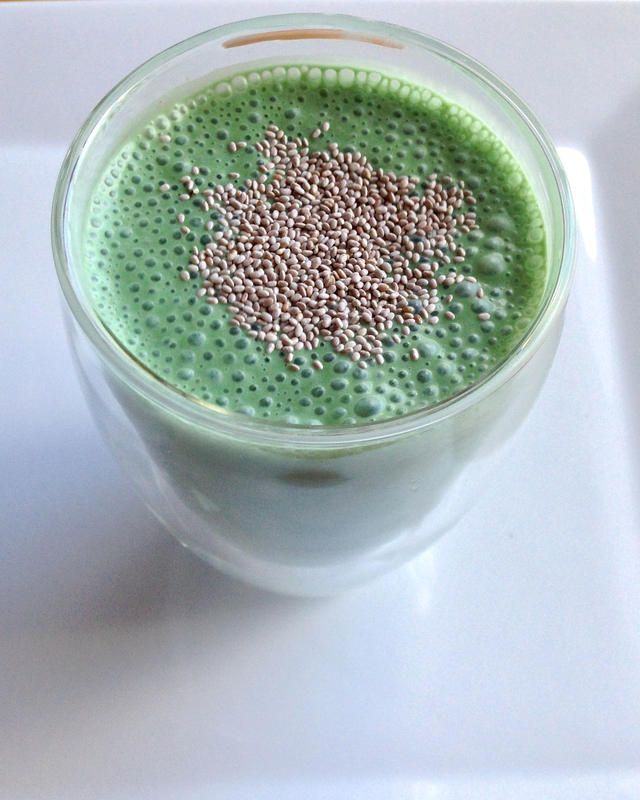 Pour into a glass and sprinkle chia seeds on the top. I call this the screaming Mama because it’s fast becoming my go to breakfast, and truth be told, I’m not a morning person. Do you drink egg flips? what’s your favourite recipe? Want a naturally sweeter chocolate alternative?